Specifically made for Keymod rails, these solid aluminum grips allow the user to have a proper hand placement on the foreend with no gap or Picatinny rail interference. 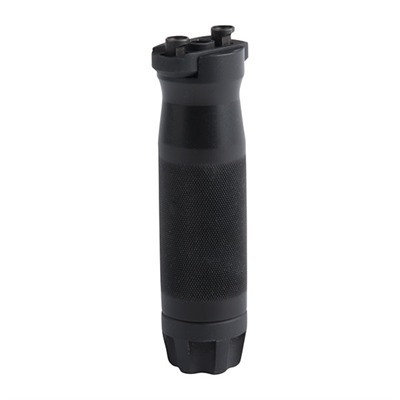 Solid aluminum grip mounts directly to handguard using the supplied attachment point. Grip features a solid steel rod through the center for added strength and to permit quick detachment. Low profile mounting plate will not get in the way even when the grip is removed and the stainless steel backer bar keeps the plate securely in place. Mfg: Samson Manufacturing Corp SPECS: 6061 T6 Aluminum, Type III Mil-Spec hard coat anodized, black. Short Grip 2-1/4" (5.7cm) OAL. 1-1/8" (2.8cm) dia. Long Grip 4-1/4" (10.8cm) OAL. 1-1/8" (2.8cm) dia.